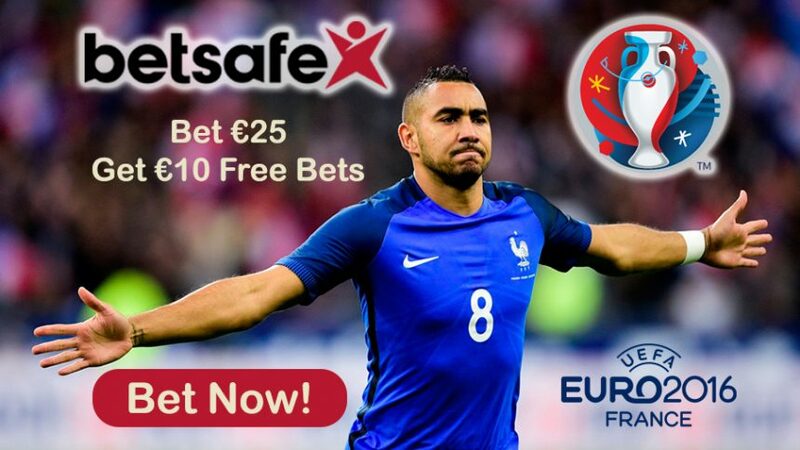 Online sportsbook Betsafe rewards players with €10 Free Bets with its Euro Free Bets Offer right before the European Championship kicks off. Join the online sportsbook today and make a wager of at least €25 to claim €10 Free Bets with the Euro Free Bets Deal! It’s as simple as that! Just make sure you make a bet on any selection before Euro 2016 gets underway on June 10, to claim the Euro Free Bets. Place a pre-match wager on any match in the 1st round of the Euros to qualify for the promo. Explore Betsafe online sportsbook and make your favourites bets on the tournament with the Euro Free Bets Offer. France, the host nation, will kick off Euro 2016 against Romania, and the online sportsbook strongly favours the former to clinch a win 1.31 (4/13) in the opening game, while the latter are deemed outsiders 12.50 (23/2). Besides this, there’ll be plenty of thrilling encounters during the tournament which can see you win tons of money if you make the right bets. Make sure to use the Euro Free Bets on any of the games. Germany 1.60 (6/11) will start their campaign against Ukraine 6.50 (11/2), while both Wales and England are set for cracking games in Group B. On June 11, England 1.90 (9/10) first take on Russia 4.80 (19/5), before they, England 1.65 (9/14), set out to play against Wales 6.00 (5/1) on June 16. In Group D, Turkey 3.70 (27/10) will go head to head with Croatia 2.20 (6/5) on June 12, while defending European champions Spain 1.44 (4/9) face Czech Republic 8.20 (36/5) the following day. Belgium 2.55 (3/2) are set to play their opening game in the tournament against Italy 3.10 (21/10) on June 13 – a match that is sure to be full of betting opportunities. Join the online sportsbook and get your hands on €10 Free Bets with the Euro Free Bets! Collect €10 Free Bets with Betsafe’s Euro Free Bets!